To imagine that I could spend six weeks drawing almost every day is unbelievable. Like a stubborn goat, I pitted my hoofs against the pull of the assignments. I recently retired from my university job as an art therapist. I decided to do this on my 60th birthday as a great gift to myself. I loved many aspects of the work but years of witnessing trauma, illness and death had taken their toll. Despite all the self-care I engaged in, I found myself prey to a variety of ailments which grew worse over time. I love art therapy; that desire to heal is an innate part of my personality, but the balance is going to shift. Now, I'm spending most of my days in the studio making art. Occasionally, I'll still facilitate art therapy groups, in particular the Young Adult Bereavement Art Group, which I helped to initiate. Friends ask me how retirement is going and I answer--fabulous! I find myself as busy as ever, without having to commute and I get to devote the time I need to the craft and business side of art, as well as to the craft of art therapy. One of the surprising joys of this transition is the ability to take time for things as simple as washing dishes. What used to be a drag after 10 hours away from home, now feels like playing with bubbles in warm water when I need a break. In a few weeks, I'll take part in an exhibition curated by Sara Post at the Davis Art Center. Titled "Material Worlds," the exhibit looks at the materials that go into artists' work and the ways in which these materials combine with ideas to bring art into being. An enticing notion, I'm excited to see what will emerge. 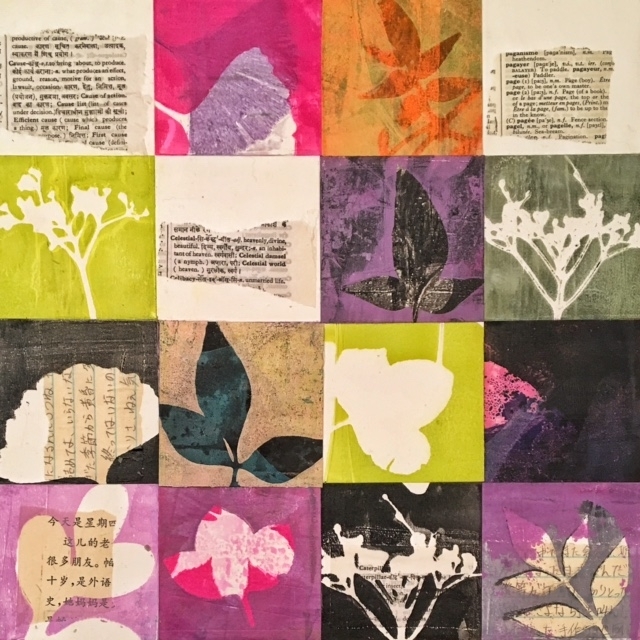 I'll be showing three different works, which take the botanical monoprints cut into trapezoids, rectangles and squares and piece them together, quilt like, on a hardboard panel. Although I didn't anticipate it, perhaps the piecing together of these papers is a metaphor for taking my life into my hands and reshaping it. So far it's working and my ailments are melting away. I feel like someone with a diary--who hasn't made an entry in a looong time. Which usually means lots has been going on. In December I wrote about my fear of preparing for my open studio. Like many things one fears, it turned out to be far easier, much less stressful and a whole lot more fun than I imagined. So much fun in fact that when my friend, Sara Post, told me about the Davis Art Studio Tour coming in April, I signed right up. I felt like a kid who'd just gone down a slide, saying "Wheee! I want to do that again!" So here I go, the Studio Tour is a cooperative of 30 artists, and like a well oiled machine, each person has their part to play. I look forward to this collaboration; working with Linda Clark Johnson on the December Open Studio was a huge learning curve and definitely a friendship deepener. In order to prepare, I've been making loose plans; plans that will become more detailed in the days ahead. In the meantime, my family and I just returned from time spent in one of my favorite places; Kauai. I've established the habit of bringing art supplies along with me and I spent all the time, when I wasn't hiking swimming or walking the beaches, immersed in plant materials and nice gooey acrylics. I want to make sure that some of the Studio Tour artwork includes and reflects the richness of this beloved island. I'll be sharing more about the Davis Art Studio Tour as the next couple months unfold. Now, up to the studio!